I am giving you three ways of exercising mercy toward your neighbor: the first — by deed, the second — by word, the third — by prayer. In these three degrees is contained the fullness of mercy, and it is an unquestionable proof of love for Me. By this means a soul glorifies and pays reverence to My mercy. "I want this image to be solemnly blessed on the first Sunday after Easter; that Sunday is to be the Feast of Mercy. On that day, the depths of My Mercy will be open to all. Whoever will go to confession and Holy Communion on that day will receive complete forgiveness of sin and punishment. Mankind will not enjoy peace until it returns to My Mercy." "I saw a great light, with God the Father in the midst of it. Between this light and the earth I saw Jesus nailed to the Cross and in such a way that God, wanting to look upon the earth, had to look through Our Lord's wounds. And I understood that God blessed the earth for the sake of Jesus." DAY 9 - The souls who have become lukewarm. First Day Today bring Me all mankind, especially all sinners. Most Merciful Jesus, whose very nature it is to have compassion on us and to forgive us, do not look upon our sins, but upon our trust which we place in Your infinite goodness. Receive us all into the abode of Your Most Compassionate Heart, and never let us escape from It. We beg this of You by Your love which unites You to the Father and the Holy Spirit. Eternal Father, turn Your merciful gaze upon all mankind and especially upon poor sinners, all enfolded in the Most Compassionate Heart of Jesus. For the sake of His Sorrowful Passion show us Your mercy, that we may praise the omnipotence of Your mercy for ever and ever. Amen. Second Day Today Bring Me the Souls of Priests and Religious. Most Merciful Jesus, from whom comes all that is good, increase Your grace in us, that we may perform worthy works of mercy, and that all who see us may glorify the Father of Mercy who is in heaven. Eternal Father, turn Your merciful gaze upon the company [of chosen souls] in Your vineyard - upon the souls of priests and religious; and endow them with the strength of Your blessing. For the love of the Heart of Your Son in which they are enfolded, impart to them Your power and light, that they may be able to guide others in the way of salvation, and with one voice sing praise to Your boundless mercy for ages without end. Amen. Third Day Today Bring Me All Devout and Faithful Souls. Most Merciful Jesus, from the treasury of Your mercy, You impart Your graces in the great abundance to each and all. Receive us into the abode of Your Most Compassionate Heart and never let us escape from It. We beg this of You by that most wondrous love for the heavenly Father with which Your Heart burns so fiercely. Eternal Father, turn Your Merciful gaze upon faithful souls, as upon the inheritance of Your Son. For the sake of His Sorrowful Passion, grant them Your blessing and surround them with Your constant protection. Thus may they never fail in love or lost the treasure of the holy faith, but rather, with all the hosts of Angels and Saints, may they glorify Your boundless mercy for endless ages. Amen. Most Compassionate Jesus, You are the Light of the whole world. Receive into the abode of Your Most Compassionate Heart the souls of pagans who as yet do not know You. Let the rays of Your grace enlighten them that they, too, together with us, may extol Your wonderful mercy; and do not let them escape from the abode which is Your Most Compassionate Heart. Eternal Father, turn Your merciful gave upon the souls of pagans and of those who as yet do not know You, but who are enclosed in the Most Compassionate Heart of Jesus. Draw them to the light of the Gospel. These souls do not know what great happiness it is to love You. Grant that they, too, may extol the generosity of Your mercy for endless ages. Amen. Most Merciful Jesus, Goodness Itself, You do not refuse light to those who seek it of You. Receive into the abode of Your Most Compassionate Heart the souls of heretics and schismatics. Draw them by Your light into the unity of the Church, and do not let them escape from the abode of Your Most Compassionate Heart; but bring it about that they, too, come to glorify the generosity of Your mercy. Eternal Father, turn Your merciful gaze upon the souls of heretics, and schismatics, who have squandered Your blessings and misused Your graces obstinately persisting in their errors. Do not look upon their errors, but upon the love of Your Own Son and upon His bitter Passion, which He underwent for their sake, since they, too, are enclosed in the Most Compassionate Heart of Jesus. Bring it about that they also may glorify Your great mercy for endless ages. Amen. Most Merciful Jesus, You Yourself have said, "Learn from Me for I am meek and humble of heart." Receive into the abode of Your Most Compassionate Heart all meek and humble souls and the souls of little children. These souls send all heaven into ecstasy, and they are the heavenly Father's favorites. They are a sweet- smelling bouquet before the throne of God; God Himself takes delight in their fragrance. These souls have a permanent abode in Your Most Compassionate Heart, O Jesus, and they unceasingly sing out a hymn of love and mercy. Eternal Father, turn Your merciful gaze upon meek and humble souls, and upon the souls of little children, who are enfolded in the abode of the Most Compassionate Heart of Jesus. These souls bear the closest resemblance to Your Son. Their fragrance rises from the earth and reaches Your very throne. Father of mercy and of all goodness, I beg You by the love You bear these souls and by the delight you take in them: bless the whole world, that all souls together may sing out the praises of Your mercy for endless ages. Amen. Most Merciful Jesus, whose Heart is Love Itself, receive into the abode of Your Most Compassionate Heart the souls of those who particularly extol and venerate the greatness of Your Mercy. These souls are mighty with the very power of God Himself. In the midst of all afflictions and adversities they go forward, confident in Your Mercy. These souls are united to Jesus and carry all mankind on their shoulders. These souls will not be judged severely, but Your mercy will embrace them as they depart from this life. Eternal Father, turn Your merciful gaze upon the souls who glorify and venerate Your greatest attribute, that of Your fathomless mercy, and who are enclosed in the Most Compassionate Heart of Jesus. These souls are a living Gospel; their hands are full of deeds of mercy and their spirit, overflowing with joy, sings a canticle of mercy to You, O Most High! I beg You O God: Show them Your mercy according to the hope and trust they have placed in You. Let there be accomplished in them the promise of Jesus, who said to them, "I Myself will defend as My own glory, during their lifetime, and especially at the hour of their death, those souls who will venerate My fathomless mercy." Most Merciful Jesus, You Yourself have said that You desire mercy; so I bring into the abode of Your Most Compassionate Heart the souls in Purgatory, souls who are very dear to You, and yet who must make retribution to Your justice. May the streams of Blood and Water which gushed forth from Your Heart put out the flames of purifying fire, that in that place, too, the power of Your mercy may be praised. Eternal Father, turn Your most merciful gaze upon the souls suffering in Purgatory, who are enfolded in the Most Compassionate Heart of Jesus. I beg You, by the sorrowful Passion of Jesus Your Son, and by all the bitterness with which His most sacred Soul was flooded, manifest Your mercy to the souls who are under Your just scrutiny. Look upon them in no other way than through the Wounds of Jesus, Your dearly beloved Son; for we firmly believe that there is no limit to Your goodness and compassion. Amen. "The time will come when this work, which God so commends, [will be] as though in complete ruin, and suddenly the action of God will come upon the scene with great power which will bear witness to the truth. It will be as a new splendor for the church, though it has been dormant in it from long ago." This indeed came to pass. On the 6th of March, 1959, the Holy See, acting on information that was inaccurately presented, prohibited "the spreading of images and writings advocating devotion to the Divine Mercy in the form proposed by Sister Faustina." As a result, there followed almost twenty years of total silence. Then, on the 15th of April, 1978, the Holy See, after a thorough examination of original documents previously unavailable to it, completely reversed its decision and again permitted the devotion. The one man primarily responsible for this reversal of decision was Karol Cardinal Wojtyla, the Archbishop of Sr. Faustina's home diocese of Cracow. On October 16, 1978, he was elevated to the See of Peter as Pope John Paul II. God is indeed mysterious and wondrous in His ways! Sr. Faustina was beatified on April 18, 1993, Mercy Sunday. She is now Blessed Faustina, and will hopefully one day become St. Faustina. "Act in such a way that all those who come in contact with you will go away joyful. Sow happiness about you because you have received much from God; give, then generously to others. They should take leave of you with their hearts filled with joy, even if they have no more than touched the hem of your garment. Keep well in mind the words I am telling you right now." Sign of the Cross, 1 Our Father, 1 Hail Mary and The Apostles Creed. "Today bring Me all mankind, especially all sinners and immerse them in the ocean of My mercy. In this way you will console Me in the bitter grief into which the loss of souls plunges Me." " Today bring Me the souls of priests and religious and immerse them to My unfathomable mercy. It was they who gave Me the strength to endure My bitter Passion. Through them as though channels, My mercy flows out upon mankind." "Today bring Me all devout and faithful souls, and immerse them in the ocean of My mercy. These souls brought Me consolation on the Way of the Cross. They were that drop of consolation in the midst of an ocean of bitterness." "Today bring Me the pagans and those who do not know Me. I was thinking also of them during My bitter Passion, and their future zeal comforted My Heart. Immerse them in the ocean of My mercy." "Today bring to Me the souls of heretics and schismatics, and immerse them in the ocean of My mercy. During My bitter Passion they tore at My Body and Heart that is, My Church. As they turn to unity wiht the Church, My wounds heal, and this way they alleviate My Passion." " Today bring Me the meek and humble souls and the souls of little children, and immerse them in My mercy. These souls closely resemble My Heart. They strengthened Me during My bitter agaony. I saw them as earthly Angels, who would keep vigil at My altars. I pour out upon them whole torrents of grace. I favor humble souls with My confidence." "Today bring Me the souls who especially venerate and glorify My mercy, and immerse them in My mercy. These souls sorrowed most over My Passion and entered most deeply into My Spirit. They are living images of My Compassionate Heart. These souls will shine with a special brightness in the next life. Not one of them will go into the fire of hell. I shall particularly defend each one of them at the hour of death." "Today bring Me the souls who are in the prison of Purgatory, and immerse them in the abyss of My mercy. Let the torrents of My Blood cool down their scorching flames. All these souls are greatly loved by Me. They are making retribution to My justice. It is in your power to bring them relief. Draw all the indulgences from the treasury of My Church and offer them on their behalf. Oh, if you only knew the torments they suffer, you would continually offer for them the alms of the spirit and pay off their debt to My justice." "Today bring Me the souls who have become lukewarm, and immerse them in the abyss of My mercy. These souls wound My Heart most painfully. My souls suffered the most dreadful loathing in the Garden of Olives because of lukewarm souls. They were the reason I cried out: 'Father, take this cup from Me, it it be Your will.' For them, the last hope of salvation is to flee to My mercy." Exercise mercy toward your neighbor by deed, by word and by prayer. You expired, O Jesus, but the source of life gushed forth for souls and an ocean of mercy opened up for the whole world. O Fount of Life, unfathomable Divine Mercy, envelop the whole world and empty Yourself out upon us. 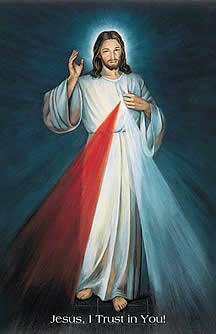 O Blood and Water, which gushed forth from the Heart of Jesus as a fount of mercy for us, I trust in You.